We are the leading manufacturer, exporter and importer of Disposable Sleeve Cover. Known for our credibility in the market, we are engaged in providing superior quality range of Disposable Sleeve Cover. 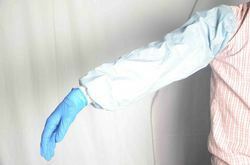 The product is widely demanded and provides seamless protection to hands from hazardous substances. These are used in various industries and are available with us in different sizes. Furthermore, the given product is quality checked on several parameters to meet the norms set by the industry. We ensure the best price and timely delivery of our product.